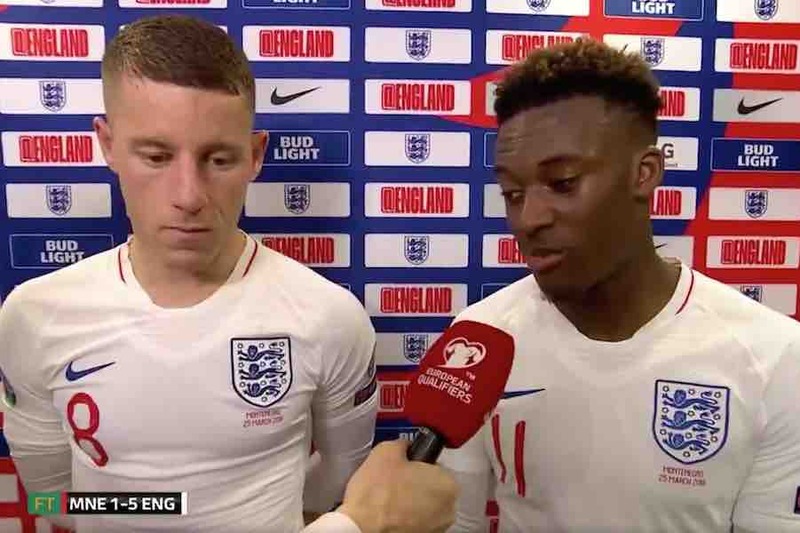 Chelsea pair Ross Barkley and Callum Hudson-Odoi faced the cameras for a post-match interview after England’s 1-5 win over Montenegro in this evening’s Euro 2020 qualifier. Barkley was the star of the show, with two goals and an assist to help the Three Lions come from behind to secure the victory. He told ITV: “It was a great night for myself. Montenegro was always going to be a hard test but we showed character to come back and put in a positive performance. His club-mate Hudson-Odoi, aged 18, impressed on his first start for England. He indicated that he thought he had performed well, but also highlighted the need to break into Maurizio Sarri’s Chelsea team. He said: “Hopefully I did well, it is not about me, it is a team performance. Great mentality from the start, going down was disappointing but we got back into it. I reacted slow to the ball and they scored from it. We have to react positively and keep going.